We all have our favorite TV shows from when we were kids – those special shows that we would always want to watch or would even wake up early to do so. The Chuggington series is just that sort of show for your young kiddies. A colorful and contemporary CGI-animated TV series from Ludorum that encourages early social readiness skills, “Chuggington” follows the amusing escapades of three young trainees, Wilson, Brewster and Koko, as they learn to “ride the rails” of life and become productive chuggers. 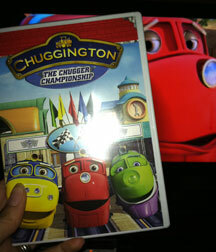 Thanks to WiC Chick Abby, we had the perfect reviewers for the latest in the Chuggington DVD series – her two boys, aged 3 and 1 1/2. When we got this in the mail my boys were so excited! They ran for their box of toy trains and each boy with a train firmly gripped in each hand, assumed their position on the floor in front of the TV. Instead of one 90 minute movie, the DVD is broken up into shorter 10 minute episodes, keeping kids engaged and interested in the DVD. Each Chuggington episode has its own story line that gently teaches kids important lessons and values. I like that the Chuggers are polite and learning good lessons as they go, hopefully in turn teaching and encouraging my kids to do the same. The show is colorfully animated, with bright and cheerful characters and a very catchy theme song. With the bits of humor and the subtle lessons, this is one show that you won’t mind watching with the kids. I think one of the truest testimonies to whether a child enjoyed a DVD is if they remember it the next day. Abby’s 3 year old really took to the characters and storyline and now use them during his playtime. He will set up his wooden train set and his trains become the characters re-enacting similar scenarios that he has seen in the Chuggington DVD. Overall, Abby was very happy with “The Chugger Championship” and the quality of entertainment it provides for her kids. If you want to Chuggington to chug into your home, you can purchase “The Chugger Championship” for your family on Amazon for just $15.99. One winner will receive a copy of The Chugger Championship. Disclaimer: This post consists of my (and/or fellow tester) opinions only. Your experiences may be different. No compensation was given for this review/giveaway. 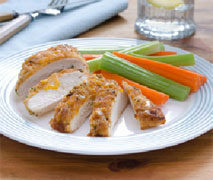 WiC Chick Abby did receive a free product from the manufacturer or their representing PR agency to use and test for the purposes of this review. This did not affect the outcome of this review. I like action chugger! My kids love this show! My kids have never seen this, but they love trains! I think they’d love any holiday themed dvds. Unlike Thomas we do not have favorites as are just now getting into Chuttington but I know he will soon have a favorite as I would like to get him these as they connect and talk and I think he would enjoy them much more than Thomas. I will choose Brewster as my favorite. Koko is number 1 in our house. My boys both love Brewster! My son loves Brewster! Thanks so much for the fantastic giveaway! My favorite character is Chugger! My sons favorite character is Wilson. I do not have a favorite, my nephw likes them all. We’re Koko fans in this house! The only one I seen with my grandson is the “Lets Ride The Rails”.